An old fable tells of a family of mice who lived in fear of a cat who hunted them day and night. Tired of fearing for their lives, they meet to find a solution to their problem. The youngest mouse speaks up and offers a brilliant solution. They should put a bell around the neck of the cat so they know when the cat is approaching and can run and hide. All the mice erupt in raucous agreement, except one, the oldest mouse. The old mouse agrees it’s a great plan in theory but queries, “who should be the one to put the bell on the mouse?” The moral of the story is that ideas are essential to solving problems, but execution is key. Similarly, agriculture remains one of the most dangerous industries despite many notable advancements in agricultural health and safety, e.g. work guidelines, guards, respirators, gas detectors, harnesses, and rollover protection structures. Like the mice, agricultural health and safety specialists have generated brilliant ideas, but struggle with how to implement them. Part of the difficulty comes from the lack of health and safety experts embedded in the farm community. These experts are often tethered to urban settings near their university or research center. Furthermore, even if the experts were all living in rural areas, there are simply not enough of them to go around. Therefore, we need influential members of the farm community to become active in gaining and implementing agricultural health and safety knowledge. We need influential members of the farm community to become active in gaining and implementing agricultural health and safety knowledge. The desire to discover a better way of delivering safety knowledge to farms drove the UMASH funded Spheres of Influence pilot project. The project enlisted agricultural bankers, insurance agents, and farmers to reflect on 32 different actors on the dairy farm, e.g. farmers, family, agronomists, veterinarians, and others. Through a series of interviews, researchers at the National Farm Medicine Center found that farmers trust each other and family the most but also understand that others might have more expertise in health and safety. The researchers also discovered who farmers would listen to, trust, and make changes if they were giving advice. Among the conclusions that emerged was that farmers trust firefighters. This may seem obvious to some as many people trust firefighters. However, asking firefighters to be a part of farm accident prevention and not simply reaction and rescue is novel. Rural firefighters are farmers’ neighbors, friends, family, or are farmers in their own right. They are a highly trainable and trusted workforce. Moreover, they are in every rural county in the U.S. and will always outnumber agricultural health and safety experts – unless they become experts themselves. 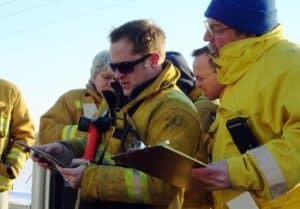 The Rural Firefighters Delivering Agricultural Safety and Health aims to equip firefighters with tools and knowledge to teach farmers to keep themselves safe. For example, farmers would be trained by a firefighter to respond to a tractor rollover and be encouraged to equip their tractors with rollover protection structures (ROPS). 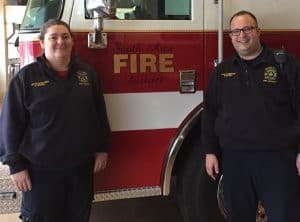 This five year project works with community and technical colleges, chiefs and training officers, firefighter and EMS associations, and agricultural insurers to move knowledge into more capable hands. Returning to the fable, in some versions of the story, a clever mouse convinces the cat to wear the bell because of how handsome he looks wearing it. 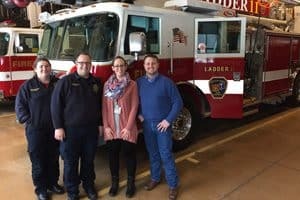 Researchers at the National Farm Medicine Center believe that rural firefighters in the Midwest and across the country could successfully convince farmers to be safer and healthier. If you are interested in becoming a firefighter/EMS trainer, please contact Dr. Casper G. Bendixsen (bendixsen.casper@mcrf.mfldclin.edu; 715-387-9410) or Kate Barnes, MS, MPH (barnes.kate@mcrf.mfldclin.edu; 715-221-7150). The Rural Firefighters Delivering Agricultural Safety and Health (RFDASH) project is a partnership between curriculum writers Matthew C. Keifer, MD, MPH (Occupational Physician), Dennis Murphy, PhD (Nationwide Insurance Distinguished Professor of Agricultural Safety and Health, Penn State University), Dave Hill (Senior Extension Associate, Penn State), and the National Farm Medicine Center at Marshfield Clinic Research Institute, as well as a variety of community colleges, technical colleges, fire/EMS departments, and insurance companies who support the project. The project PI, Casper G. Bendixsen, PhD, is a cultural anthropologist who uses research in agrarian and pastoral ethics to improve farm safety. This project emerged from a UMASH Pilot Project, the Spheres of Influence: Mapping and Engaging the Institutions that Can Influence Agricultural Safety and Health. 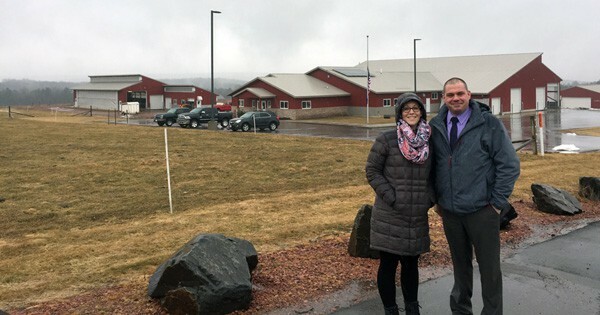 Dr. Keifer, Dr. Murphy, and Mr. Hill have extensive leadership and experience in curriculum writing, especially within agricultural safety and health.